How often have you heard someone yell out to you, “If you eat too many sweets, you are going to get diabetes”; almost every time you tried to make a beeline to the dessert counter? People often say this in the most literal sense. 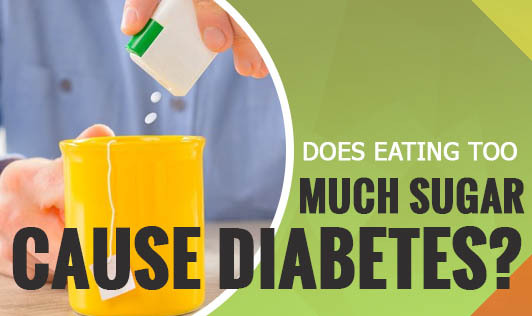 However, the fact is that excessive sugar consumption does not directly lead one to diabetes. It only acts as a contributory factor to the condition. Increased insulin resistance and/or increased hepatic output of glucose. Decreased beta cell response from pancreas and/or decreased insulin production. Sugar, on the other hand does not affect insulin production or resistance. But eating too much sugar can result in excessive calorie intake which can in turn lead to obesity, a major risk factor linked to diabetes. The body derives energy from the food you eat in the form of glucose. The pancreas secretes the hormone insulin allowing cells to absorb glucose. Diabetic people may not produce enough insulin, thereby preventing optimum absorption of glucose from the blood. In case of a non-diabetic person, a high sugar diet may not cause a spike in the blood sugar, but instead, cause a sudden increase in insulin production. This proves that a rare day of sugar-filled goodness may not be so bad after all. But if it becomes a regular, the body could certainly become insulin resistant, leading to obesity and diabetes. And a high-sugar diet could prove extremely dangerous for a diabetic person. To conclude, while sugar may not be a direct causal agent of diabetes, if you are currently diabetic or at risk, diet is certainly something you must pay more attention to. This condition could get especially worse as a person ages, as insulin production or resistance rapidly diminishes or increases as age advances. Diabetes should not be taken lightly. Even if one isn’t diabetic, a proper low-sugar diet can prevent a large number of other conditions that could pave the way for diabetes.